With the advent of data science and the increased need to analyze and interpret vast amounts of data, the R language has become ever more popular. However, there’s increasingly a need for a smooth interaction between statistical computing platforms and the web, given both 1) the need for a more interactive user interface in analyzing data, and 2) the increased role of the cloud in running such applications. 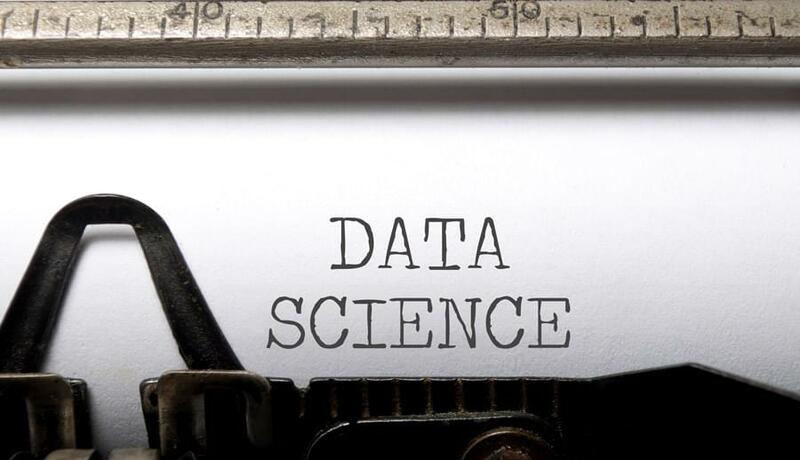 Statisticians and web developers have thus seemed an unlikely mix till now, but make no mistake that the interactions between these two groups will continue to increase as the need for web-based platforms becomes ever more popular in the world of data science. In this regard, the interaction of the R and Shiny platforms is quickly becoming a cornerstone of interaction between the world of data and the web. In this tutorial, we’ll look primarily at the commands used to build an application in Shiny — both on the UI (user interface) side and the server side. While familiarity with the R programming language is invariably helpful in creating a Shiny app, expert knowledge is not necessary, and this example will cover the building of a simple statistical graph in Shiny, along with some basic commands illustrating how to customize the web page through HTML. 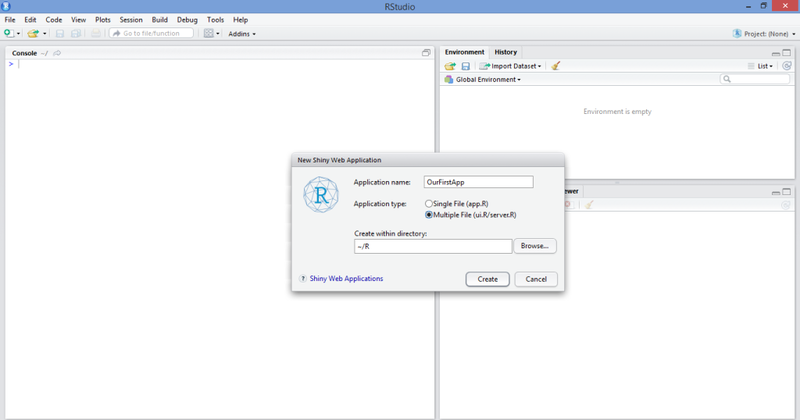 To start off, we must first install the RStudio platform in order to create and run a Shiny Web App. 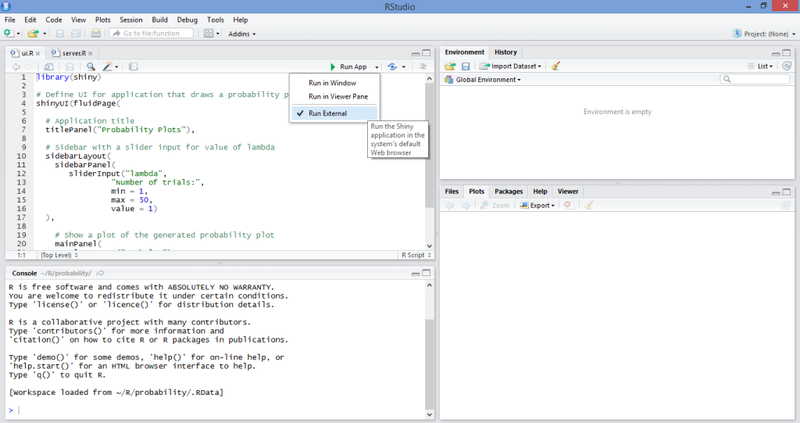 RStudio can be downloaded from the RStudio website. Once we’ve loaded the RStudio platform, we then create our new Shiny web application by selecting the New File option, and then the Shiny Web App… option. 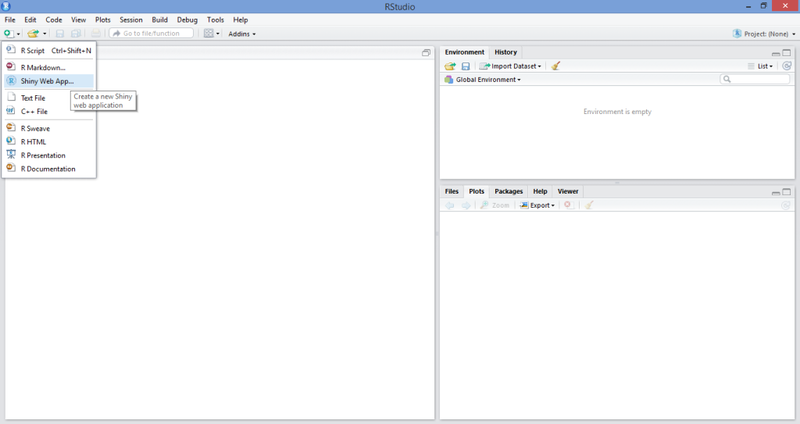 While we could select Single File (app.R), this literally just combines the ui.R and server.R scripts into one. I personally prefer to keep the two separate in order to keep the code less cluttered, but this is a matter of personal preference. As a side note, there’s also a web platform available on the Shinyapps site, which allows users to share their Shiny applications online, as well as use the rsconnect package to control such applications remotely from the R console. While the methodology for doing this is outside the scope of this article, I definitely intend on expanding this topic further in subsequent articles given interest. In any case, once we have named our Shiny Web App and opened up the source code, we’re presented with a template app that uses a dataset “Old Faithful Geyser Data” to generate a histogram. For the purposes of this tutorial, we’ll be writing our own app and customizing it according to our needs. As already stated, the primary components of a Shiny Web App are the user interface side (ui.R) and the server side (server.R). 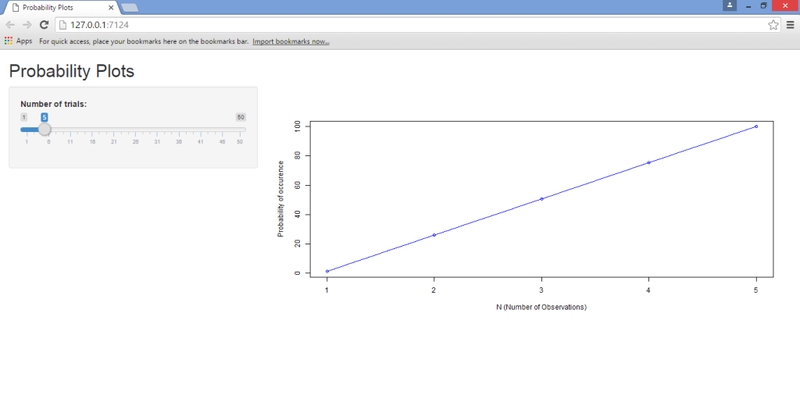 For this particular app, we’re going to create a simple line graph with a plot of N observations on the x-axis and probability of occurrence on the y-axis. Essentially, this app creates a slider allowing us to select a value (N) between 1–50. N can be thought of as the number of trials, i.e. if a value of 2 is selected, then 2 trials equal a probability of 100 percent. On the other hand, if a value of 50 is selected, then 50 trials must be conducted for the probability of occurrence to equal 100 percent. 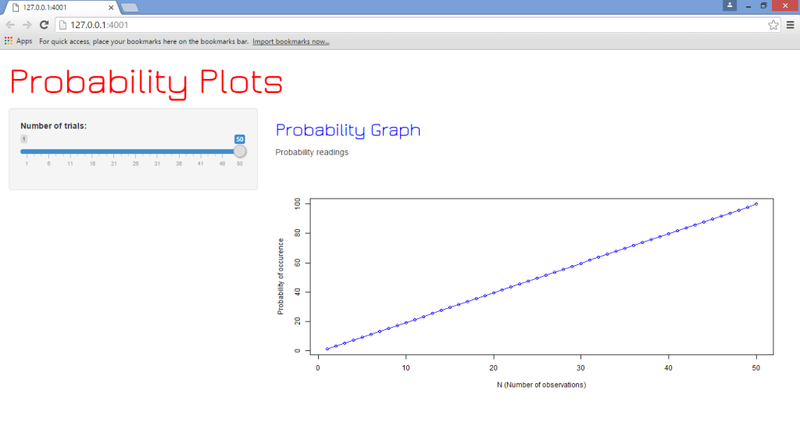 On a graph where N = 50, then sliding back down to N = 25 would correspond to a 50 percent probability, and the graph updates to reflect this automatically. Note that this is somewhat of an overly simplistic example mathematically, but is merely being used to illustrate how reactivity works in the context of graph generation across the Shiny platform. As we can see, running this app through Shiny has made it much more user-friendly, in that the slider allows for instantaneous manipulation and observation of the results. This is known as a reactive expression, where the values of one variable automatically update given changes in another. Had we chosen to run this program using R solely, then we would need to type a new value for N into the source code each time we wish to run the program, and this is ultimately very monotonous and inefficient — especially for users who don’t already have R language knowledge. The sidebarLayout function is what allows us to create the sliding sidebar that enables us to input a specific value for the number of trials. We’re defining this by means of the min (minimum value), max (maximum value), and value (which is the number of values between each value in the series). Note that, in the server.R script, the code includes both the ggplot2 and scales libraries. When running the program yourself, you will notice that these two libraries are not strictly required to run this particular application. However, I have included them as the ggplot2 library is of great use when running more sophisticated graphs, while the scales library allows for greater customization of graph data that requires different scaling methods across a range of axes or legends. As seen above, we created an application that is able to use a reactive expression in updating a line graph and its axes instantaneously. However, given that we are creating a web page with the application after all, suppose that we wish to update the page design using HTML? The HTML editing that we’ll perform here is, in itself, quite basic. For this tutorial, we’ll simply concentrate on how to edit the titles of the web page in terms of font and color. However, the purpose behind this is to illustrate specifically how to edit the user interface code in R to be able to customize the web page, which is the main takeaway for this tutorial. 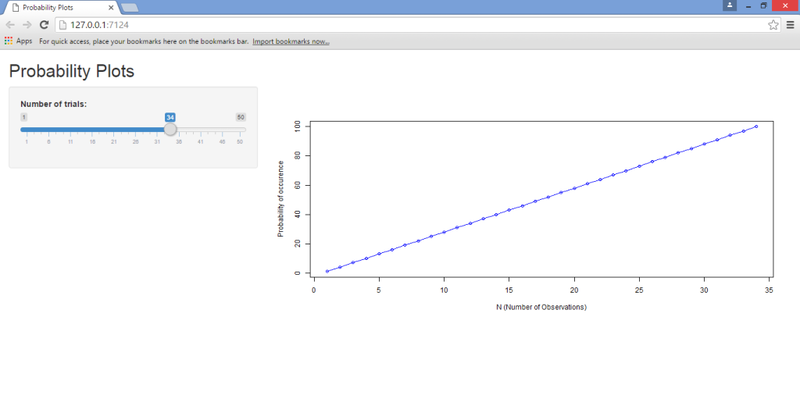 This involves a slight modification of the ui.R file that we generated above to allow for HTML inserts. One of the most important things to note is that we are only modifying our ui.R file — the server.R file remains the same as above. This is clearly because HTML is being used for the purposes of modifying the user interface; it’s not being used to modify the parameters of the application itself. In looking at the difference between this ui.R script and that of the previous one, we note that we’re adding to the shinyUI(fluidPage) command by defining Google Fonts as the font family using the tags$head command. Moreover, we use the h2 heading to define the “Probability Plots” heading for the page itself, and subsequently the h3 heading to define the “Probability Graph” for the graph we have plotted. Using HTML to customize Shiny webpages. Needless to say, this application is merely touching the tip of the iceberg in terms of Shiny’s many capabilities with the R platform. I hope this tutorial has been helpful and of interest to you. Let us know what you think in the comments below, and tell us if there are any other Shiny and R topics you’d like us to cover. Michael Grogan is a data science consultant, with a profound passion for statistics and programming. He regularly utilizes programming languages such as Python, R and SQL to analyze a wide range of datasets, and also explores aspects of web development in designing interactive web apps for data science analytics. Find him at michaeljgrogan.com.